Gary Lightbody of Snow Patrol was so knocked out by last night's show in Katowice that he sat down and wrote us this piece. I had to write about this. I simply had to. I hope I'm not speaking out of turn here as this is U2's site and hallowed ground for all of you but this story needs to be told. The shows so far on this tour have all been amazing and each night the crowd's reaction to U2 has been loud and joyous and passionate. Last night in Poland though was something else. Hard to explain. Let me try. I have never in my life seen a crowd reaction like that of Katowice last night. Right from opener Breathe there was a daft magic in the air. Insanity everywhere you looked. People's faces clothed in the kind of joy I've only seen in gospel churches and then only on the TV so to see this religious fervour up close was overwhelming. The city outside the stadium could have been under heavy fire from alien spacecraft and I don't think anyone would have heard, saw, or indeed cared that much. Then The Edge takes to the piano for New Year's Day (playing it guitar pick still between his fingers!) and the place is bathed in red and white instantly. Red cards held aloft by the people on the floor and white cards in the seats to make a giant Polish flag you could probably see from space. It took the breath clean out of me. By the end even Bono was speechless, for a few seconds anyway. The things he said next are lost to me verbatim but what I won't forget is the tears that came to me then. In floods. And when I turned to check if anyone had snared me for blubbing I realised that every single person around me also had tears in their eyes. We were sharing something that simply never happens at rock shows anywhere. A collective emotional and spiritual surrender of epic proportions. This was majesty and tenderness married and that is a rare thing indeed. Last night was something I've never seen before and I can't quite fathom it. Not sure I ever will or even want to. It will sit alongside the greatest nights of my life and I thank U2 and Poland for that. Also thank you to the Polish U2 fans for giving us the best reaction to our own set we've had on this tour so far. All in all then a night of triumphs. I would tour with this band (we all, us Patrollers, would) 'til the last grain of sand tipped gently into the bottom half of the hourglass and yes that sounds (and perhaps is, why not) a massive hint hint to stay on this magic carpet ride a little/a lot longer but believe me when I say this: this is the greatest show on earth. Why on earth would you buy just anyone's cockatoo? Long may they reign! Thank You Gary!Deeply Moving! You ROCK! The butterflies in my belly are working overtime. Gary's words makes this one gal more excited to experience this momentous journey to U2. Thank you so much for sharing this with us. Even only just seeing the pictures gives a nice impression of the magic in that night! I was in Amsterdam, 20th of july, and I have enjoyed a magic show myself! But maybe because I knew it would be the only show I would see this tour...who knows? I can't wait for the next show actually!! Thank you again Gary, and keep playing with U2, for me it was actually having TWO concerts!!! First you and then U2! Fantastic! Thank yo for the great review Gary. I am going to see U2 in Toronto at the Rogers Center on the 16th of September. I am very much looking forward to it. I have seen U2 three times and always amazed Bono, Edge, Larry and Adam and how they make the crowd feel apart of the show. I know that hearing "Where The Sreets Have No Name" will be very hard for me since I will never forget seeing the Superbowl performance in New York and having known people who lost their lives on 9/11. I am taking my wife whom has never seen U2. Welcome back to Canada and Toronto to you and the boys Bono. This was truly an unbelievable night. Made us all proud to be there and to be Polish. From the very beginning, from the Snow Patrol show it was clear that everyone was extremely happy to witness such an occasion. This was "a night never to forget". Thank you! Dziękuję! Thanks to Gary, Poland and U2! I was there in Chorzow and still am emotional about what I witnessed there in this beautiful intimate stadium. I trully want to thank Gary as indeed they give a new meaning to being support act. I was amazed at you performance in Amsterdam (saw U 2 there twice) but Poland was truelly amazing. I don't think that many Poles know Snow Patrol there yet, but this didn''t stop them from going Crazy! And U2 still had to come on!! What happened during their show (and of course during NYD) was bringing tears to my eyes too! And a lovely Happy Birthday and Sto Lat (100 Years) for Edge.... I still get the shivers looking at footage on You Tube. 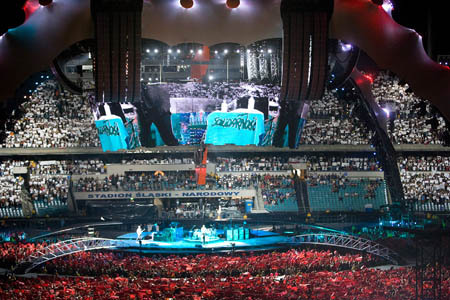 Luckely I have ONE more chance to see U2 on this tour, coming Saturday in Wembley will be my 4th and final concert. Sure this will be a great show too. Only I truelly regret that Snow Patrol will not be there! Gary, please come back soon to Amsterdam! And thank's to You, U2 and all the Poles (and others) that made this grown man cry! See you in POLAND !! Without SNOW PATROL would not be the same evening. Fell to his knees before you. I listen to "Run" and still think about us. When a concert in Poland? I found a new group. See you in POLAND. THANK YOU!! Well, it seems to me hat we're almost in one band Gary ;) Hope that we will meet when you came to Poland not only as a support but for your own tour. You're more than welcome! Dear Gary ! Great thanks for your letter. We felt that those night in Katowice was special. Your words confrmed it. And specially you were a important part of this miracle. Your positive music and energy wich you gave us were important preludium to U2 the best show ever ! It could happens in Poland only ! Gary and all Patrolers ! Please come to Poland again soon ! Thank you Gary for your lovely letter! It really feels great to read letters like yours and I am truly happy to see that you've publicly acknowleged the magic that happened in Chorzow, from the "outsider's" perspective... but this is not all the magic that happaned that night. I would like to write you about the day preceeding the concert and the night after... I've travelled to Chorzow by car, driving from Warsaw. I was shocked when I got stuck in traffic already in Warsaw, and that was at 1pm, beeing surrounded by cars with U2 signs on their windscreens... What a crap I thought at first worrying that I will not make it on time to Chorzow!!! But despite the fact that this traffic continued all the way down to Chorzow, drivers were very kind and cooperative, which rarely ever happens on Polish roads!!! It took us over 6 hours to get down and all this way we were surrounded by U2 fans, driving down to Katowice from all over Poland. This already felt incredible. The same thing happen on the way back to Warsaw in the middle of the night... The stunning thing was that although the traffic congestion was really bad, there was this great feeling of unity on the road. So thank you to all the fans for having such a great attitude and making this whole experience such an unforgetable pleasure. And by the way Gary, I hope that Snow Patrol will eventually play a gig in Warsaw. I've seen you in Dublin, I missed you in Chorzow.. :( Please come! I can still hear the sound of every song in my head - it will not leave me. This was an unforgettable experience, the scent of it lingers and will not go away. From the moment we got to the stadium, through the wonderful performance of Snow Patrol to the last sounds of a magical show from U2 I felt enticed. I never want to forget this night, but I do want for it to happen again. I always love U2! Now I love U2 and Snow Patrol! Thanks for beautiful concert and great support! what a beautiful piece. how wonderful to be moved in such a way. Of course all U2 fans know that their music and lyrics are profoundly moving, yet when you heasr them live it is like being transported to a higher plane. I will be at the gig in Cardiff on the 22nd August and i dearly wish Snow Patrol were going to be there too. that would be a dream gig for me! Gary luv this is why I've seen U2 more than I have fingers or toes almost as many as 2 peoples fingers and toes!! It's what draws me back tour after tour and keeps me blubbering in joyous tears time and again! I know of what you speak although inexplicable it is a shared bond! I can not wait to bare witness to it again! See ya all in September!! I had the honor of seeing U2 and SP together at Croke a few years back. I'm beyond thrilled your back on board again!! wow it sounded better than croke park 24/07/09. what a wicked experience to have my hubby half polish we will be there at next concert when they go again. they are fantastic. What is it with Irish bands? Their music can bypass the ears so its heard with the heart! It feels so great to read it! Thank you! Thank you! Thank you! For your show, for your music, for this letter. Come to Poland as often as possible! We'll sing and dance with you, for you, for us! Viva Snow Patrol! Thank you for this great account of the Poland show. Wow! 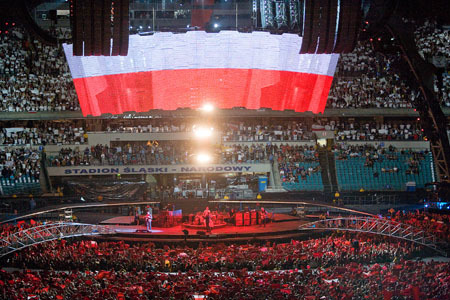 I hope that the Toronto and NY audiences are into showing their love for U2 the way the polish fans did. What an amazing show thisust have been! It is always good to hear great things about your favorite band. BTW, I am also looking forward to hearing you, Snow Patrol! !